Volunteer or intern abroad on over 150 projects across Asia, Africa & Latin America! Whether you have 2 weeks to 6 months, are an individual, couple, group or family we have opportunities in the fields of: environmental conservation, marine and wildlife conservation, teaching, health and medical, building, nutrition, sports, community development, childcare. 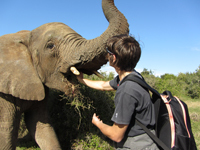 We also offer a tailor made volunteering gap years to meet your needs, interests and calendars. Kaya were awarded Best Volunteering Organisation at the British Youth Travel Awards 2014. As a volunteer or intern, you can participate on these projects and work together with the local people, contribute to sustainable development and gain a whole new set of skills and experiences. Our internship projects are especially exciting for those looking for professional experience abroad and to boost their CV. Internships have also been undertaken for academic credit in the past. At Kaya they can help you chose your perfect placement and arrange you your life outside the project. All of the staff at Kaya are ex volunteers and they are there to advise you on their projects and your volunteering options. So take a look at www.KayaVolunteer.com and start making a difference today.